Sobralias stand out owing to the fact that they can grow up to fifteen feet high, and their foliage is just as prize for decorative purposes as their blooms. This orchid's beauty is fleeting - its flowers only last a few hours to a few days. The blooms of Sobralias can come in shades of pink, purple, green, red, yellow, and white. The leaves are usually long and thin, and they can grow from one to twenty feet in length. 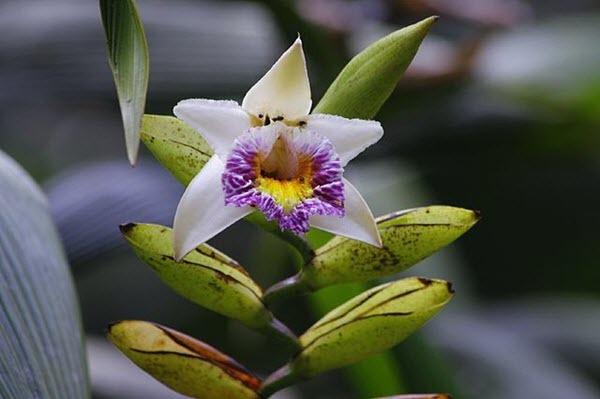 There are over 100 different species in the genus, and it is seen as one of the most rewarding orchids to grow. Depending on the species, your orchid can do very well in daytime temperatures ranging from 50°F to 90°F (10°C to 32°C). If you're not sure which species you have, a safe temperature range is generally between 70°F to 85°F (21°C to 29°C) during the daytime. During the night, they can usually tolerate temperatures between 55°F to 60°F (13°C to 16°C). However, most can survive temperatures as low as 40°F (4°C). These orchids can tolerate full sun, but they're more prone to getting sunburned. Ideally, you want your orchids to get at least partial shade throughout the day. If you live in the northern hemisphere, you can place them in a bright south or east-facing window. This will allow them to get the bright morning sunlight, and they'll get shade in the afternoon. If your plant is healthy, but it doesn't seem to be growing as it should, you may want to try more light. Yellow spots on the leaves or brittle edges are an indication that your plant is getting too much sun. These plants grow the best if they're kept consistently moist. In their native habitat, there is constant water dripping down around them. You want to water them in the morning hours every other day and make sure they're soaked all of the ways through if you're growing them in pots. For outdoor cultivation in flower beds, you won't have to water them daily. Every other day should be more than enough to keep them moist, but this does depend on how hot their environment is throughout the day. Your humidity levels should stay between 50% and 70%, year round. Sobralias like regular applications of a well-balanced fertilizer to keep them growing. Fertilize your orchid once a week with half diluted strength fertilizer. When your orchid is actively growing, you can apply 20-10-10 diluted fertilizer and switch it over to a 0-10-10 diluted fertilizer when they are flowering. As these orchids don't go through a rest period, you want to apply your weekly amount of diluted fertilizer once a week year-round. The frequent watering will ensure that they don't get too much fertilizer buildup around their roots, and they'll get the nutrients they need to grow continuously. They do best in a fine, breathable potting mix. Coconut husk pieces or fine fir bark are excellent choices as they allow airflow while helping your plant maintain its moisture levels. These orchids don't like to be disturbed once they've started growing, so you should only repot them when you notice the roots sticking up out of the potting medium in the spring. Additionally, if you plan to divide them into smaller segments, you want to leave at least six growths to a segment to ensure they survive the division. See a Sobralia growing outdoors. Pay attention to its long reedy stems, veined leaves, and the beautiful lavender flower at the end. Next, John Romano shows you step-by-step how he repots his Sobralia seedlings that have started to push themselves out of their pots. Very informative! Do You Have These Orchids?